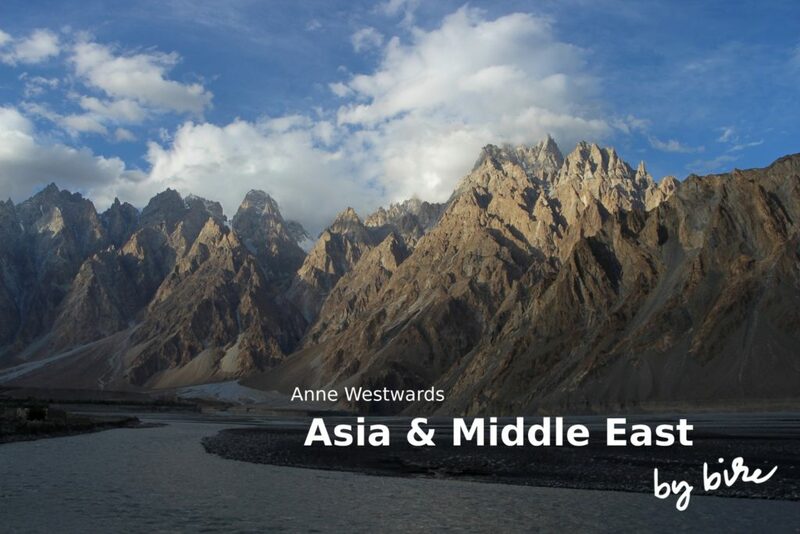 Discover Asia and the Middle East through the eyes of Anne Westwards: a fearless woman on an epic solo cycling expedition with her fully-loaded bicycle. 13 countries (one featured per month), thousands of kilometers, more than a year in the saddle. 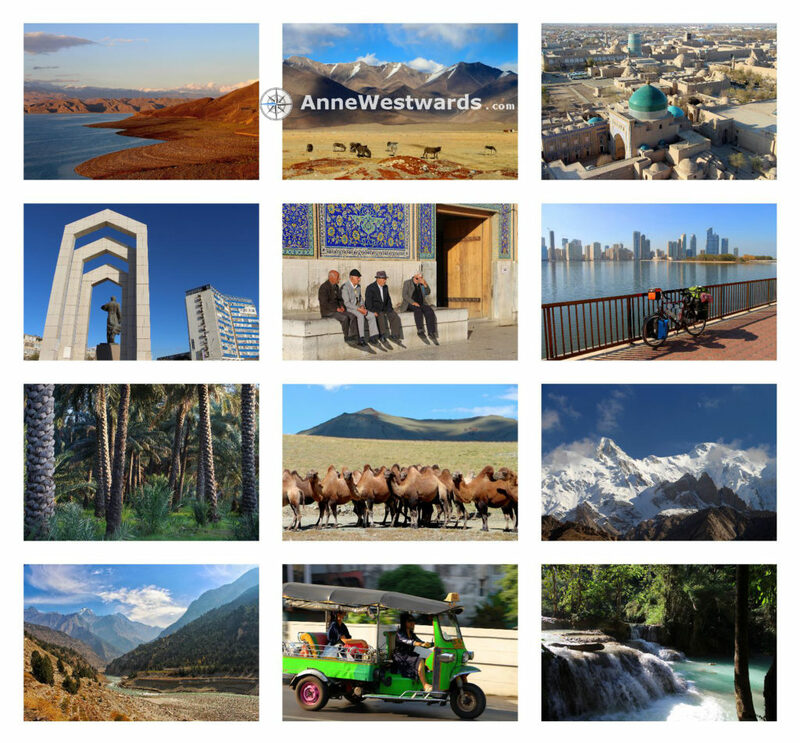 Enjoy stunning photography far off the beaten track, from the awe-inspiring Karakorum in Pakistan to the endless steppe of Mongolia. The perfect present for anyone with a sense for adventure traveling. Ignite your wanderlust! 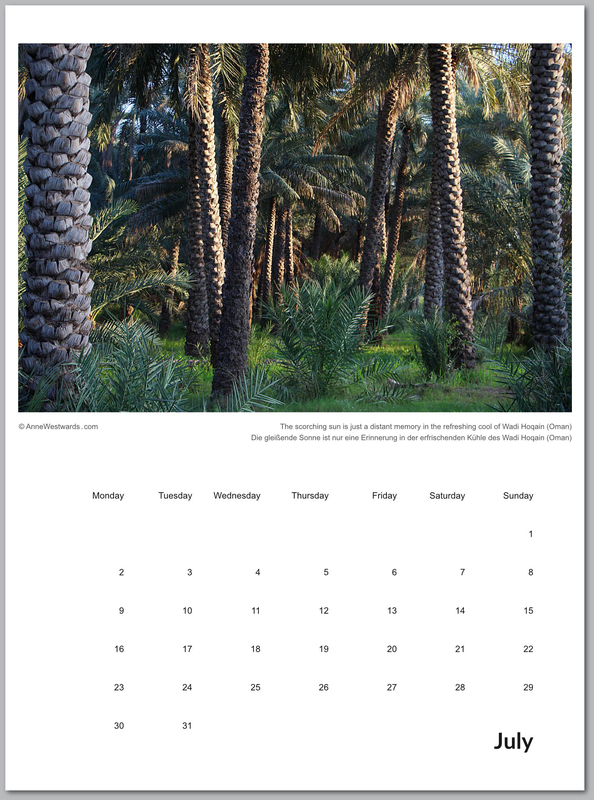 If you are interested, here is a little write-up of the story behind each photo featured in the calendar. Those moments meant a lot to me, both while on the road and in hindsight. I hope you enjoy diving into those moments with me! 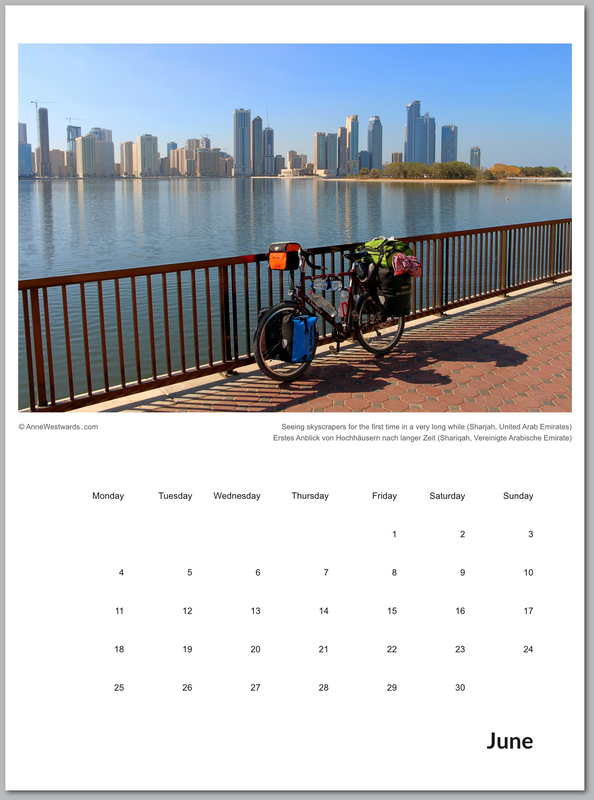 By buying this calendar, you support me on my journey – exploring the beauty of the world on a bicycle, sharing the stories of my travels in words and photos. My first expedition was completely self-financed with my savings. Together with the earnings from last year’s calendar, this allowed me to cycle until spring this year, which is when I ran out of money. Now, I am taking my childhood dream serious and start my own business as an author, photographer and speaker – all with the hope of being able to get onto my bike again soon for the next expedition. The world is too beautiful to stop exploring! Any support for my journey is very much appreciated. 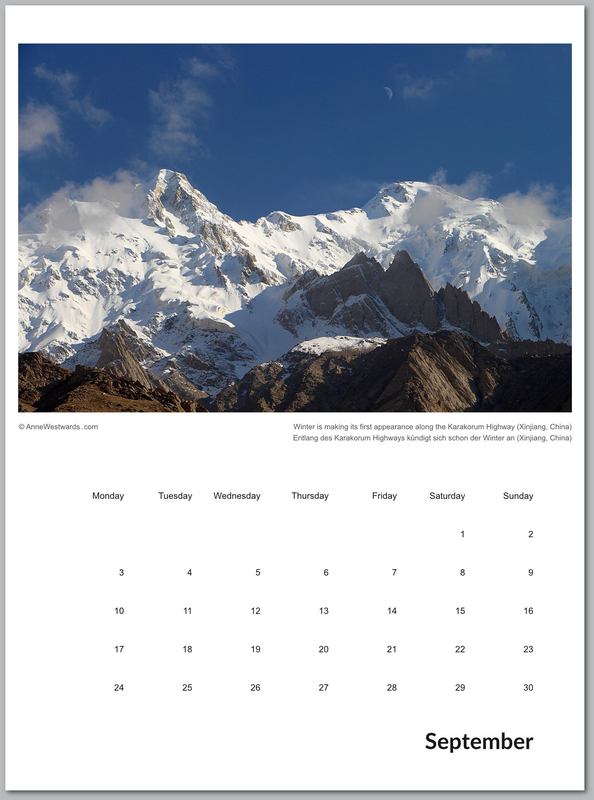 Thanks so much for stopping by – I hope you find the calendar as inspiring as I do! 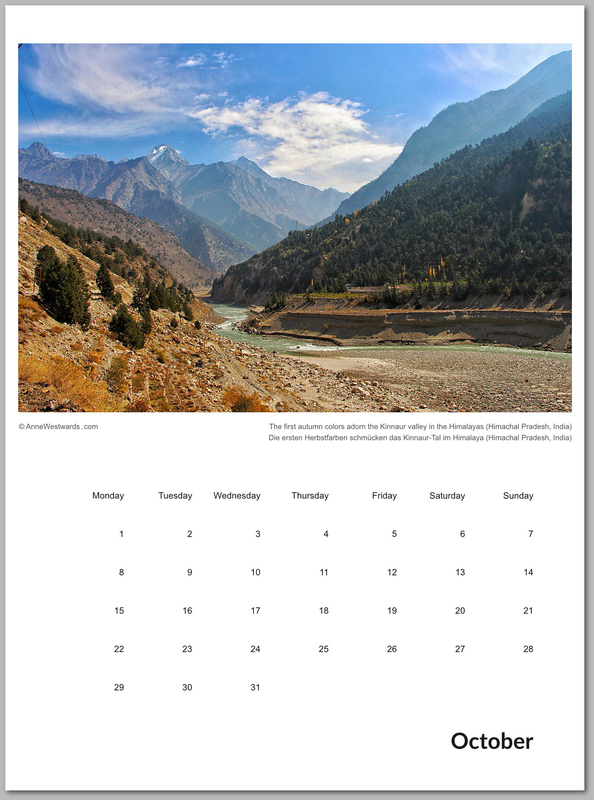 I have done my best to ensure that the calendars are affordable, but of the best quality possible. 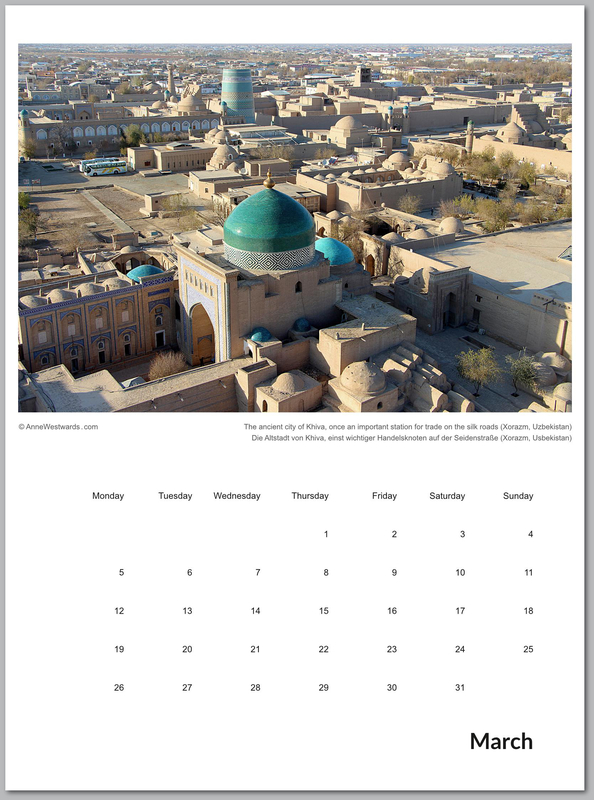 The majority of the calendars (worldwide version) are being printed by a traditional printing company based in Berlin, Germany, renowned for their top-notch quality. For the USA, I have found a print-on-demand company, whose print quality is also excellent. The grid style is a little different between the two versions, as the print-on-demand company in the USA uses their own grid design. Why two versions? In order to keep the prices and shipping low for you, as well as to ensure that you receive you calendar in a timely manner. 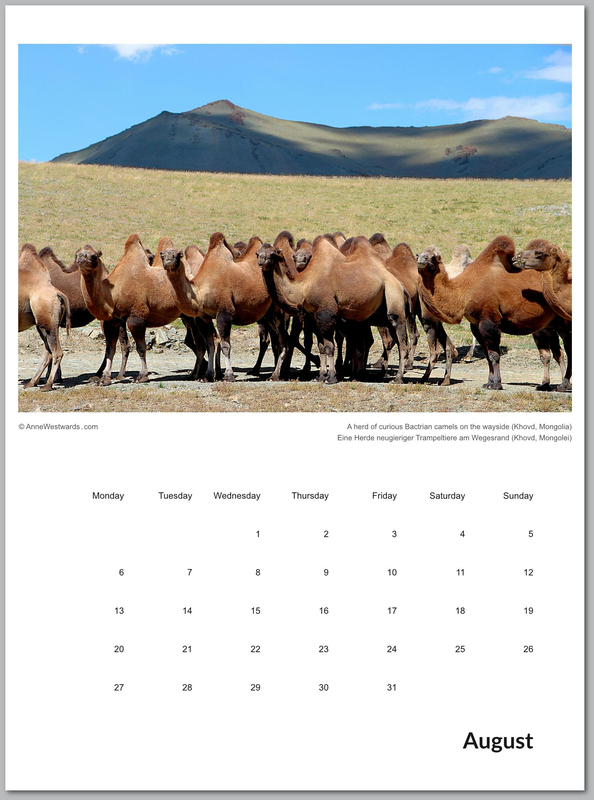 You are interested in ordering a calendar or maybe more? Fantastic! 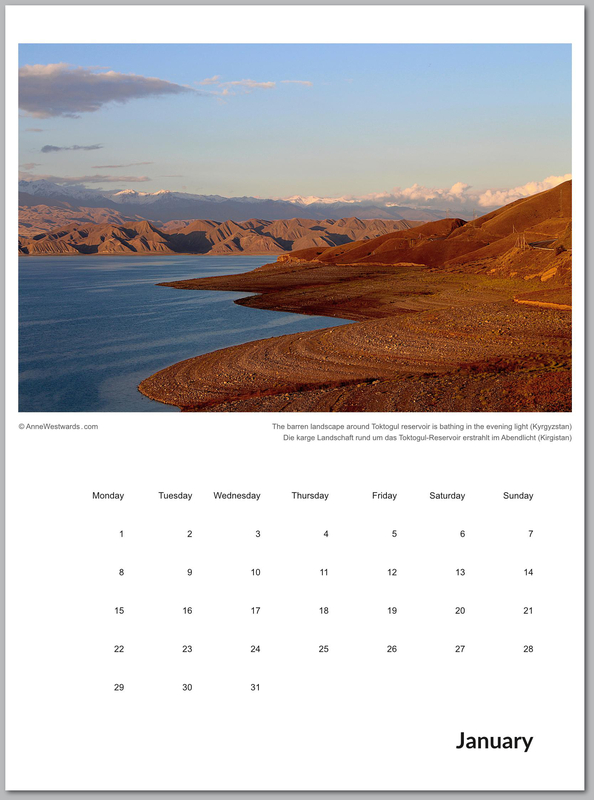 Note: If you order postcards along with your calendar, the postcards will ship for free. Click here to take a closer look! Payment is possible via bank transfer (from EU bank accounts) or via paypal (from any account worldwide). Since the majority of the calendars are being printed in Germany, shipping to addresses there is a bit cheaper. Since we’ll be handling the shipping in Berlin, we can make sure that we offer you the most affordable shipping rates. For the US version, the print-on-demand company handles the shipping and thus sets its own rates for this (nothing I have a say in, unfortunately). Please note that the discount in shipping is only possible if the calendars are shipped to the same address. The volume discount for ordering more calendars still applies, of course, if you want to have your calendars shipped to different addresses. You want to get more than three calendars? Wonderful! Get in touch and we figure out a special discount for you (go through the order process below at point (3) and we will get back to you). 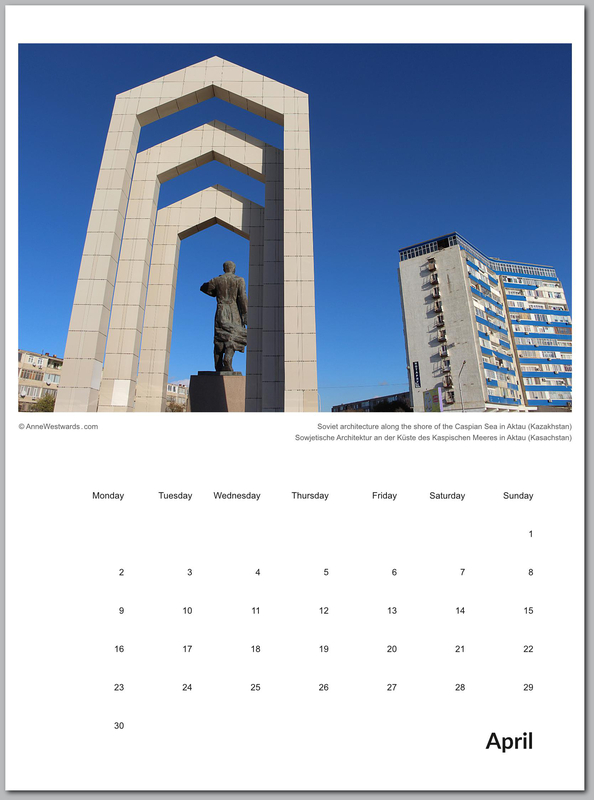 The calendars will be shipped at the beginning of December, such that it reaches you no later than mid-December and well in time for Christmas. 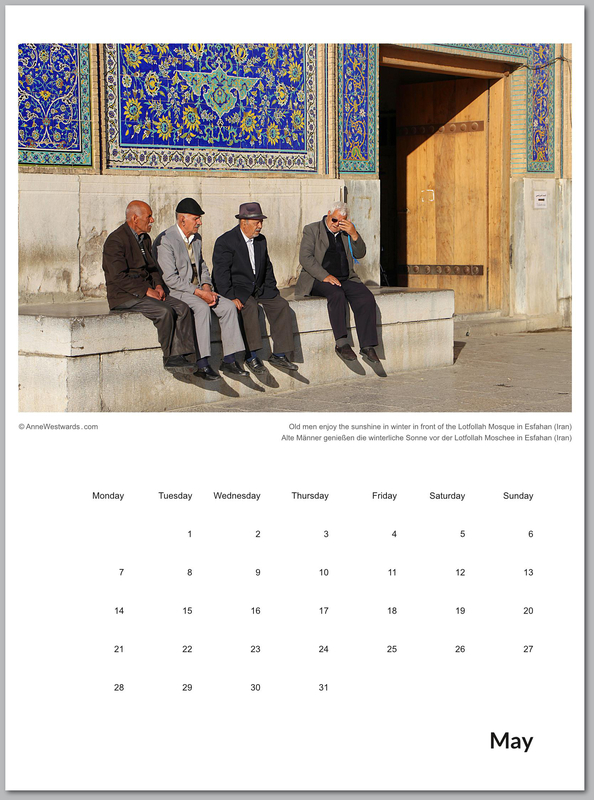 If you need to have your calendars earlier (as a birthday present, e.g. ), just send me a note when you order it and we will see how we can make it possible. If you are based in the USA or the EU: Lucky you! 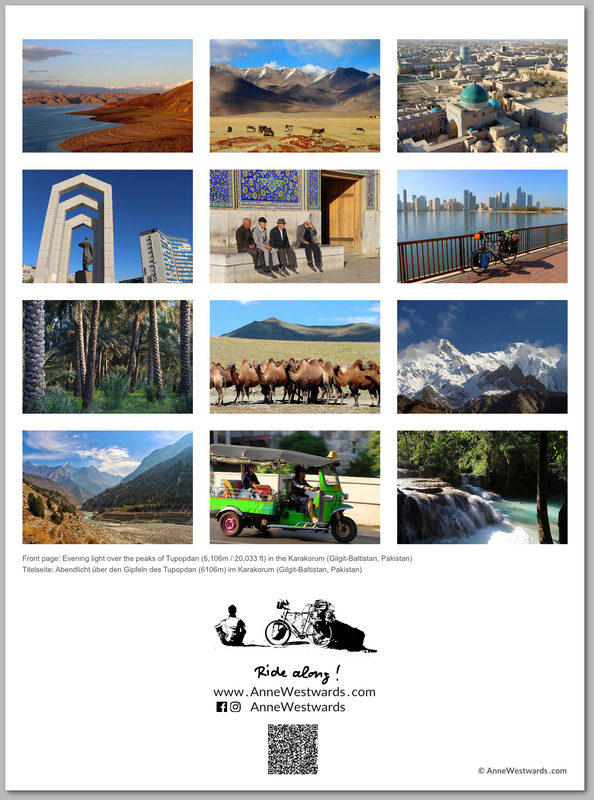 You will not have to pay customs – one of the reasons why I went through the hassle of finding two options to get calendars printed. You can stop reading here. 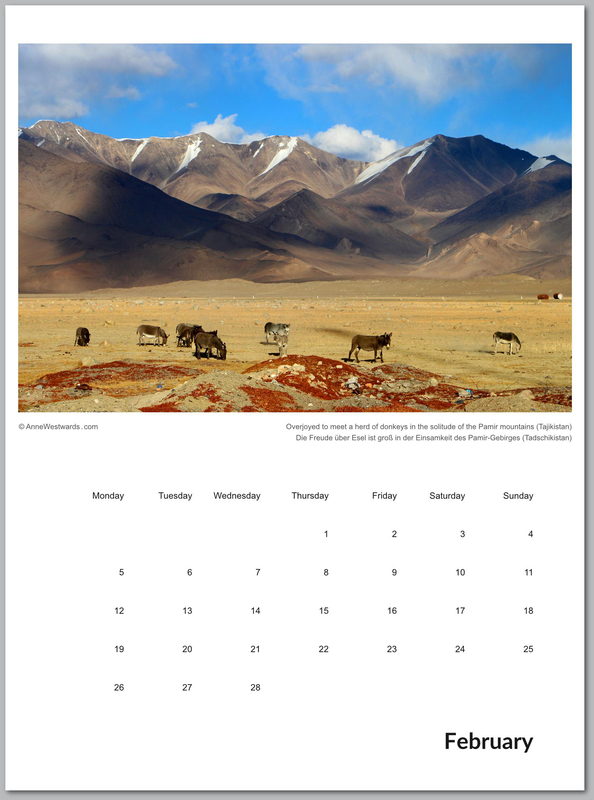 If you are based elsewhere on this beautiful planet: The worldwide version of the calendar is being shipped from Germany. Thus, please inform yourself how much the customs are to receive a print product from Germany, in order to avoid an unpleasant surprise. Customs is nothing I have a say in – this depends on international treaties. Also, the money does not go to me, but your country’s government. If it is cheaper for you to receive a print product from the US, rather than Germany, please mention this in the order and we will surely find a solution. 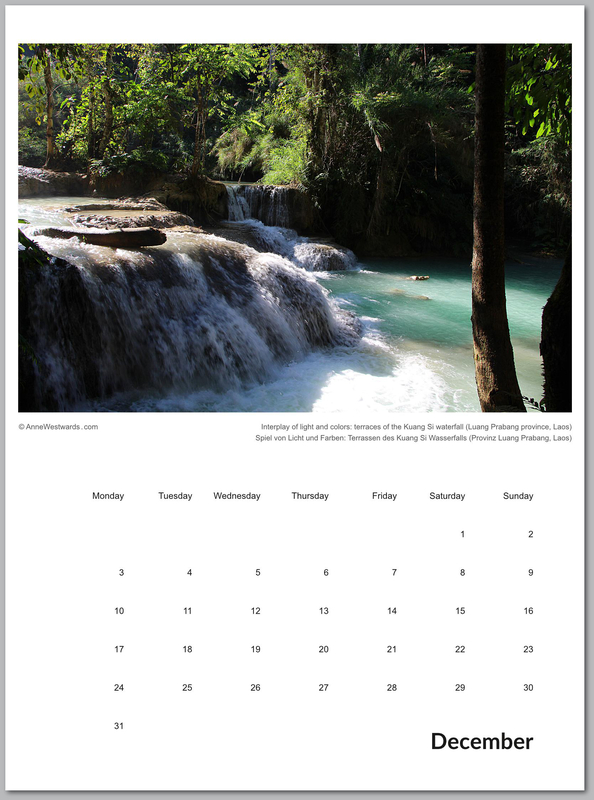 We hope that you will be very satisfied with your calendar. If not, please get in touch with us via via anne.westwards AT gmail.com, explaining the problem and mentioning the original order (amount, shipping address, name). Orders are being taken now – I am looking forward to yours! We promise to do our best to make sure that you receive your order as smoothly as possible. For ordering, please copy the following text into an empty e-mail, fill out the details and send it to anne.westwards AT gmail.com. (Please note: in order to copy the text if you are not using a mobile device, you have to highlight it and hit CTRL + C on your keyboard, as the right-click menu is disabled). 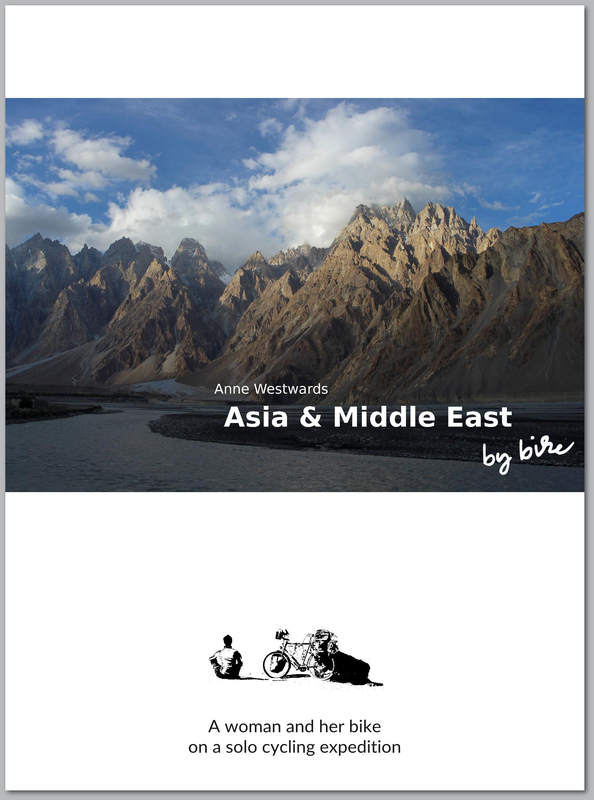 I would like to order the calendar 2019 “Asia & Middle East by bike” from Anne Westwards. If you’d like to receive postcards as well with your calendar, just let me know! 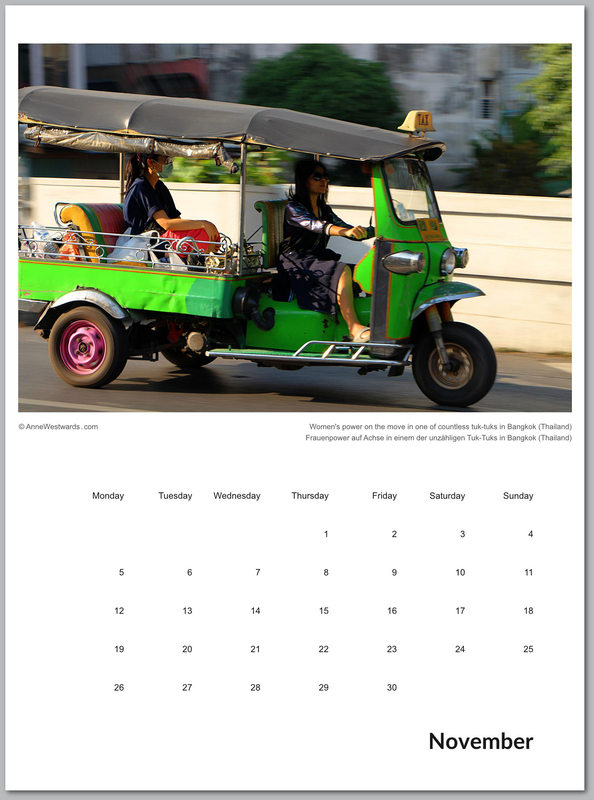 They can ship for free with the calendar (you can have a look at the postcards here). Once your e-mail reaches us, we’ll send you the information needed for payment (bank transfer / paypal). As soon as your payment is received, the order will be processed further. Please note that bank transfers take a few business days to be processed, while paypal is received instantly. Thanks so much for your support! I hope you are as excited about the calendar as I am!